At the time of writing, the cryptocurrency market is in the red. The major altcoins, which have been gaining momentum throughout previous weeks, now seem to be consolidating. In the past few days, Bitcoin has shown signs of relative strength, while Ethereum and Ripple remain neutral from a short-term perspective. However, at the moment, and in line with recent trends, the biggest altcoins are falling. It seems the leaders of the February highs, such as LTC and EOS, are now among the weaker digital currencies. With that in mind, traders should enter positions carefully, unless said positions are favoring a decline in price. Still, despite the decline in price of the major altcoins, I remain quite bullish on the fundamentals. Just look at the Bitcoin and Ethereum hash rate, the growing number of Lightning nodes and wallet applications, and the steady development and release of new updates and partnerships by numerous projects like Loom, POA, Stellar, and Bitcoin Cash. Honestly, I see no reason for long-term traders, investors, and hodlers to worry. Things take time to build, that’s just the way it is. No matter how much money you throw at it, there’s a limit to everything, even to human genius. To put your minds at ease, I’ve compiled some statistics I find relevant for our understanding of how the cryptosphere is evolving. I’ll steer this piece away from price talk, as I really want to focus on other topics that I believe will play a major role in the long-term price and adoption of cryptocurrencies. When we look at the most important measure that guarantees both security and decentralisation – the hash rate – you’ll see that it keeps growing both in Bitcoin’s network and in Ethereum’s. As you can see in this graph from Blockchain.info, Bitcoin’s hash rate has been steadily growing since Bitcoin’s inception. This isn’t a surprise. As Bitcoin’s popularity grows, more users get attracted to the digital asset, helping the long-term upward movement of BTC’s price. We shouldn’t forget that the higher the hash rate, the more secure the network is, as it becomes harder to attempt 51% and double-spend attacks due to the growing cost of electricity. At its peak, Bitcoin’s hash rate was at 59 million THs. The same can be said about Ethereum’s hash rate. 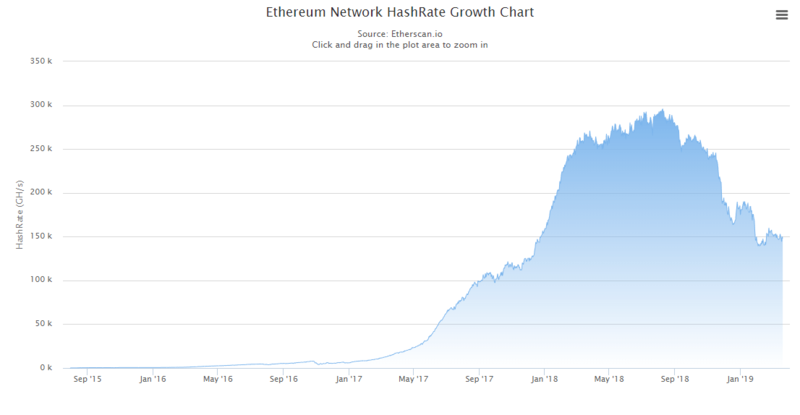 Looking at the growth of Ethereum’s hash rate, we can see a steady positive slope forming since ETH’s inception. At its peak, Ethereum’s hash rate touched near 300,000 GHs. This clearly shows the cryptocurrency community keeps supporting and believing in the project, despite the recent *perceived* lack of progress. As I said, things take time to build, and if we really expect the Ethereum developer team to come up with a brilliant solution to the scalability problem without compromising decentralisation, then the waiting is worth it. When the Beacon Chain is released, alongside Plasma and Staking, I’m sure that will provide an uplift for the entire dApp ecosystem. Those are great numbers, and it means Bitcoin can potentially start competing with other cryptocurrencies, namely Bitcoin Cash, as a fast digital payments system. Hopefully both will continue to grow, giving crypto enthusiasts more than one alternative to quickly send digital value. 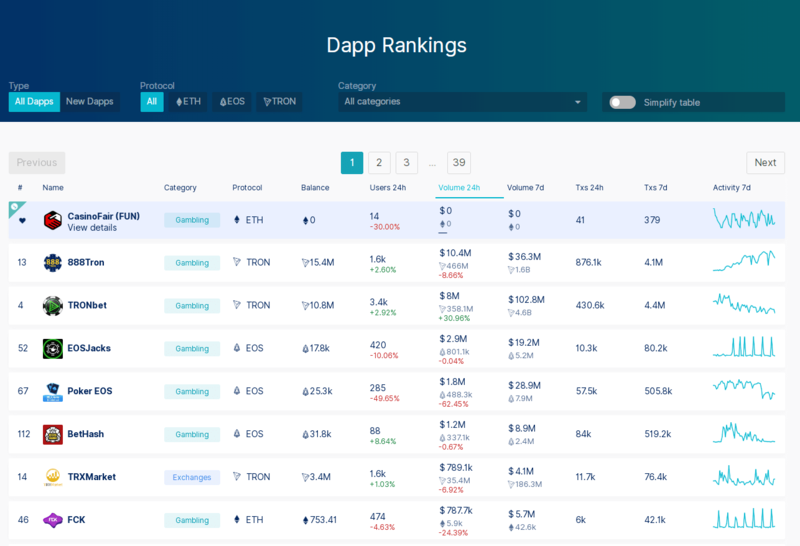 Meanwhile, Ethereum, Tron, and EOS dApps continue to grow, especially the latter two, giving the fact transaction fees are considerably lower. The sort of dApps that are getting more traction are gambling and gaming dApps, which is to be expected. I argue that not too far in the distant future, maybe two years from now, that list will feature considerably more Ethereum-related business and social dApps. Whatever happens, as long as dApps continue to grow, I’ll surely be happy. At the time of writing, the Loom Network seems to be the project making the most waves in the Ethereum community as it is already using Plasma, giving users the chance to stake LOOM tokens. Finally, Stellar is also making interesting improvements, not only in terms of price (as Stellar Lumens (XLM) has been skyrocketing), but more importantly in terms of business adoption and user growth. 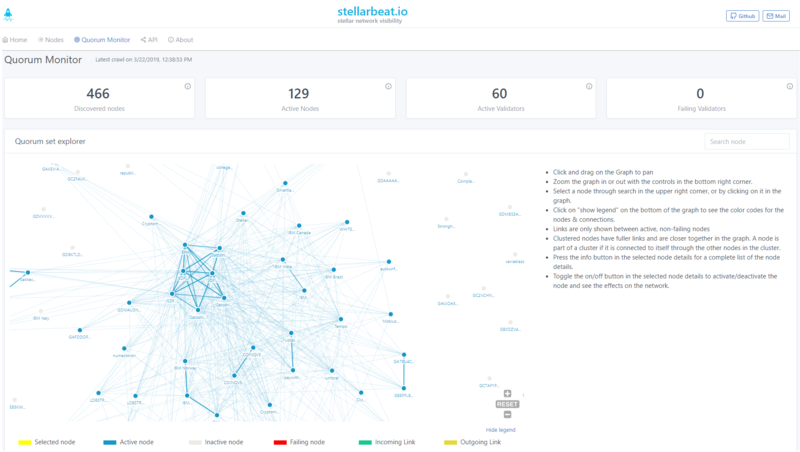 When we look at Quorum, Stellar’s blockchain scanner, we can see there’s loads of activity and connections between different parties, with only a handful being completely disconnected from the rest of the nodes. That means there’s a growing number of open source developments as more nodes become network validators, reach other nodes, and open connections among themselves.